Not all all-wheel drive systems are created equal; that’s the message Subaru is saying with the “Subaru Faceoff” test drive event happening from Friday, December 2 to Sunday, December 4 at the SM Mall of Asia opening parking Block 12. 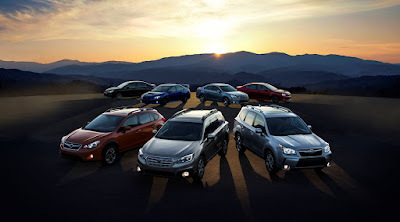 With a history that dates back more than 40 years, Subaru’s Symmetrical All-Wheel Drive or SAWD provides power to all four wheels continously from the get-go. This provides maximum traction, balance, and control regardless of driving condition. This provivdes more confidence on wet or perfectly dry pavements, especially during critical accident avoidance maneuvers. Meanwhile, thanks to the impeccable balance of the SAWD system, enthusiasts will also love the enhanced road grip under acceleration leading to increased performance. This is compared to other four- or all-wheel drive systems which require a switch to send power to all four wheels. Some only have an on-demand system that activates only in the event of a slippage. In either case, both systems do not provide the same level of all-weather, all-condition confidence as Subaru’s trademark system. This weekend is the perfect chance to get behind the wheel and experience what it’s like to have power on all four wheels. And if you put safety and performance as top prorities in your next new car purchase, Subaru is offering special promotions and discounts on site. Why pay premium for a system we seldom use? In most driving conditions 2wd mode is enough, and has lower fuel consumption. 4wd as needed is more practical i think. TBH, compared to its rivals among each category, Subaru has the same fuel consumption, sans the turbo models. Gasoline fed crossovers as daily drivers are for those who can; rest of us can drive in our compacts, sub compacts and diesel SUVs. And don't worry, if it doesn't make sense to you, you're probably not the target market intended by this niche car maker. I agree. our 2014 forester consumes less fuel than the dual clutch ecosport in traffic. I average about 7-9kms/liter and 15-17 on nlex. its not the most fuel efficient car but at least its not a gas guzzler like the previous generation.